In Ponca City, First UMC has been engaged all season in thanks-giving. The church partners with New Emergency Resource Agency to collect food each Thanksgiving. This project begins with the children in late October. During their missions time at M&M’s, which is the church’s weekly after-school program, kids ages 4-12 decorate sacks with pictures of turkeys, pumpkins, and more. On Sack-Out Sunday, Nov. 6, the children passed out their sacks to church members during worship. A week later, on Sack-In Sunday, 89 sacks filled with groceries lined the steps in front of the altar, thanks to the members’ generosity. The next Wednesday during M&M’s, the children took a field trip to the resource agency to learn about the mission — and deliver nearly 1,000 pounds of food to bless others. Alongside the filled sacks Nov. 13 in First Church’s sanctuary were 48 boxes of gifts to be mailed to Marines serving aboard the USS Somerset, deployed as part of the 11th Marine Expeditionary Unit. The Ponca City church’s enthusiasm for this project is because of a specific Marine on board that ship: Cpl. David Gilliland. The Ponca City native grew up attending First UMC. In September, the congregation learned about the 11th MEU and took up a challenge to send a gift box to each of the Marines in Gilliland’s berthing. After the donations were collected, the children packed those boxes, also during M&M’s, adding their own thank-you letters and pictures. On Sack-In Sunday, both the sacks of food and boxes of goodies were blessed in worship. The people of First UMC hope all who receive the items are blessed by their contents and the prayers that accompany them. 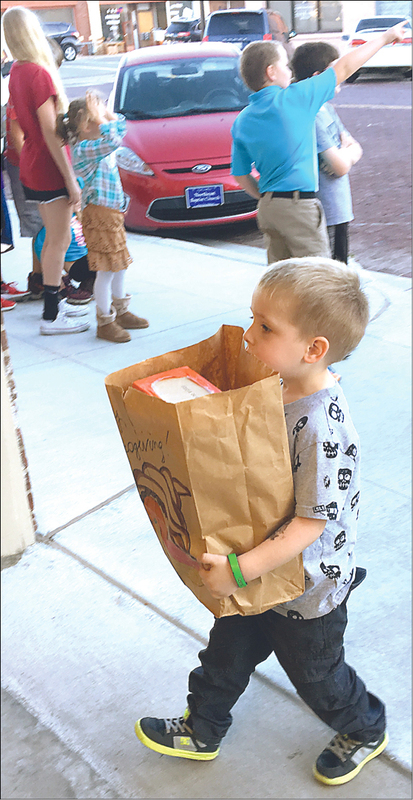 M&M’s kids deliver food to New Emergency Resource Agency, Ponca City.